With the holidays approaching, it's been on my mind more now than ever that I want to savor the sweet times with Beau. I really want to plan intentional ways for us to create keepsakes and make his first holiday season really special. For him, for us, and for the rest of our family. I was set on wanting to get some pottery done with his hand and footprints, so I called up our local pottery shop. It turns out that getting a plate completely done for you can get really pricey really fast, and I was convinced that I could do it.. so off to the pottery shop we went! 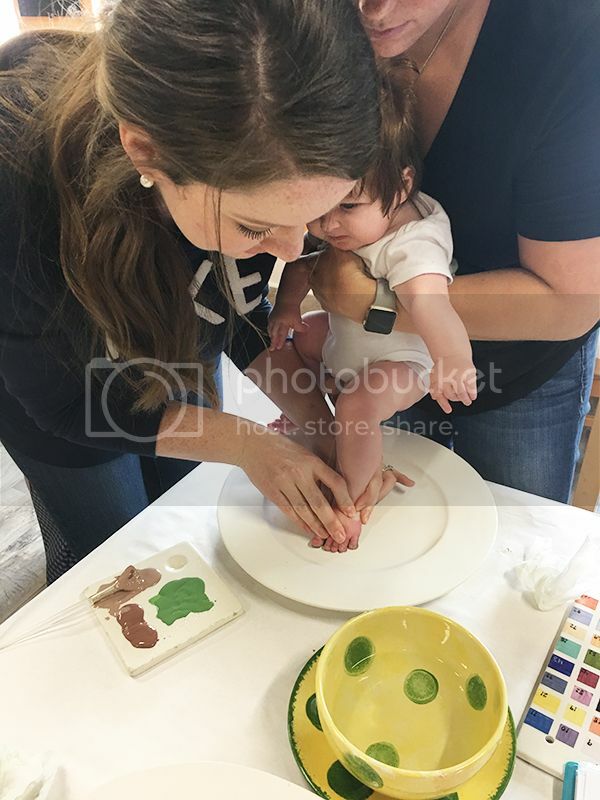 I chose a morning where two friends could accompany me to help get Beau's hand and footprints taken care of, and about 20 minutes into our time my mother in law came to pick up Beau so that I could paint the rest of the pieces without worrying about what Beau was up to. This really helped the process a ton! I realized that I really enjoyed creating something different and our of my ordinary daily activities. The plate that I kept is for Thanksgiving! This is a progress photo, partially done. I could write on the plate in marker and the marker burns off when they fire the pieces. This one is a great example of that! As you can see, I started marking out the letters and it was really bad placement haha! That plate has already found a home and was a birthday gift for my mother in law. We also knocked out a few more gifts while we were at the studio. 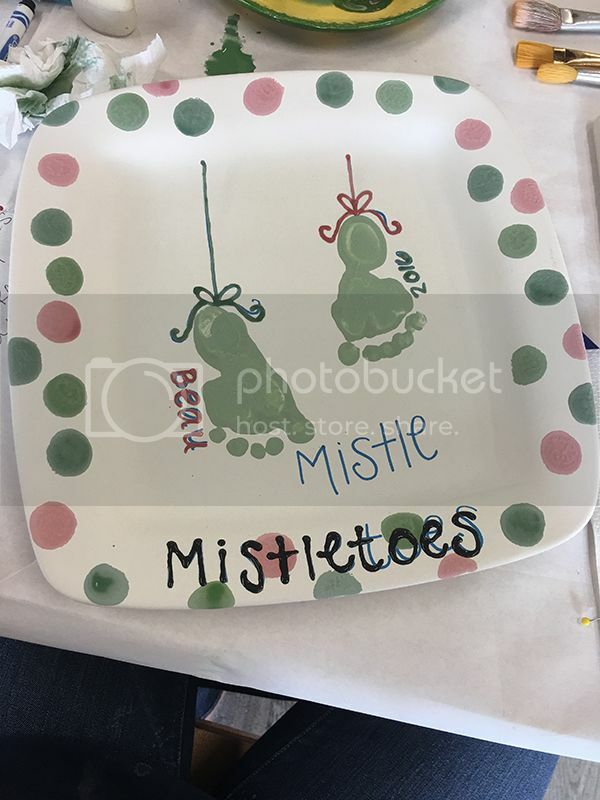 The way that ours worked is that you paid a "studio fee" for all your paint and supplies ($8) and then you just pay the cost of whatever pieces you're painting. So in two sessions we knocked out a TON of gifts and keepsakes. After the first time we went, after I got the pieces back Ben requested a mug! So a little footprint tractor was the perfect gift for him. I also wanted a Christmas ornament for us after seeing they had gotten some in! 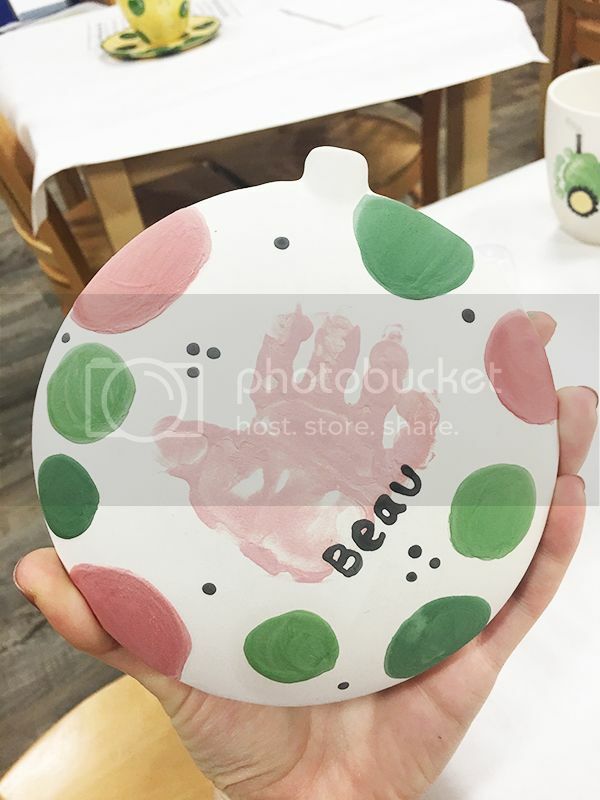 The other side was a footprint and it says 2016 where the hand says Beau. The studio I went to had a ton of examples there, but I also looked on pinterest. Our studio also had the option of paying $10 per piece for lettering, and names and ages always free. The girls in the studio said my lettering looked great, but in the future having them paint the letters is something I would really consider. 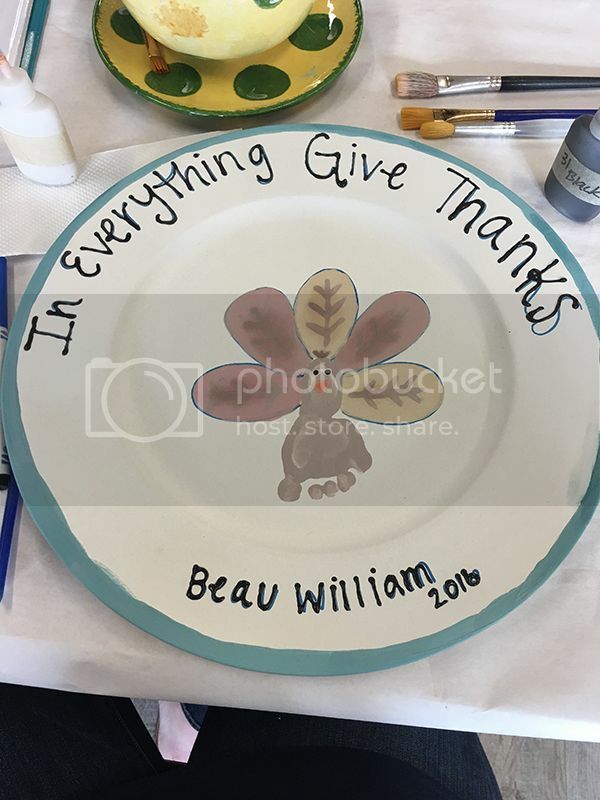 I don't have any Easter decorations, so I'd love to do a decorative plate for Easter in the spring, and maybe have them letter it. I'm really really pleased! Have y'all ever done handprint art? There are so many creative ideas out there! This is so cute and something all of you will cherish for years to come!! The mug is SO cute! I've seen the mistletoes idea on Pinterest but not the tractor on the mug--I bet Ben loved it! And yay for blogging 3 days in a row!! This is such a great idea! Your dishes turned out great! 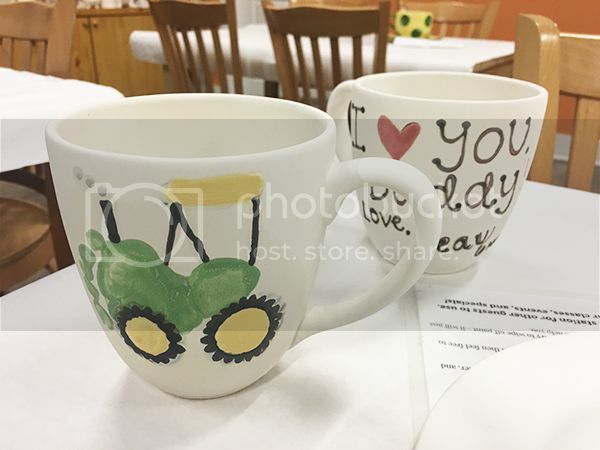 This is adorable, I already know that when my husband and I have a little one he's going to have to have a similar tractor mug...it's fitting because my hubby is a farmer! Oh these are so cute-ESPECIALLY the mistletoes :-) Love it! How cute! I used to work at a Color Me Mine and we would do this with families all the time! It was one of my favorite parts of the job. So so cute! I love the turkey and the tractor! !